A case against a gay man in Doncaster, in the north of England, who was accused of 'recklessly' transmitting HIV to two male complainants, has been dropped due to lack of evidence - apparently there had been no investigation of the previous sexual partners of the complainants who may have infected them. I don't have a lot of details about the case, which I first heard about in March 2009, and I would like to protect the identity of the accused who has obviously been through hell for at least 15 months. What I do know is this: two men had complained to the police that they believed that they had been infected by the accused during separate dates. (I don't know whether the complainants knew about each other before they went to the police, or after). The Crown Prosecution Service (CPS) took their complainants seriously enough to prepare a 'reckless grievous bodily harm' prosecution under Section 20 of the Offences Against the Person Act 1861. To prove the element of causation of such 'grievious bodily harm' (i.e. 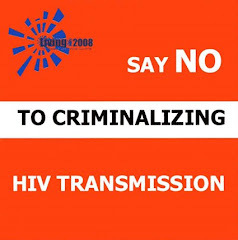 HIV transmission), the prosecution must prove beyond reasonable doubt that only the accused could have infected the complainant(s). I'm reliably informed by the man's defence lawyer, Khurram Arif, that the trial was meant to commence yesterday at Doncaster Crown Court. The defence had prepared a scientific report examining the likelihood that only the accused could have infected both complainants. The report highlighted that the complainants' previous sexual partners may also have infected them and that phylogenetic analysis could not rule this out. Yesterday, the prosecution consulted with its own scientific expert and conceded that since both complainants had previous sexual partners and the police did not investigate nor eliminate them as possible sources of infection, there was no case to answer. This is, in fact, what the CPS guidelines state. This is one of several cases defended by Mr Arif, where a lack of attention to the detail of what scientific evidence can – and cannot – prove has led to the CPS dropping cases very late in the day. As Mr Arif notes in his email to me: "The prosecution, when making such allegations, have to prove that they have closed all the doors to the possible sources of infection. Again, in this case, they did not." The case highlights that in England & Wales, people accused of such 'crimes' should never plead guilty and should immediately contact an HIV organisation for advice in order to be put in touch with an expert defence lawywer, such as Mr Arif, who services legal aid clients through Christian Khan Solicitors and private clients through GSC Solicitors. In addition, complainants need to be aware that making such accusations requires them to reveal their entire previous sexual history and to name all of their sexual partners since their last HIV-negative test. Only when they have all been contacted and tested for HIV can a prosecution actually reach trial.